The foot of Asama Mountain Range is truly a natural treasury. The Ikenodaira Marsh is a wonderland of alpine vegetation. In late spring, the blossoms of dicentra are a sight to see. In spring, summer and fall, you can enjoy hiking in Ikenodaira Marsh, taking trips around Mt. Asama, or climbing mountains such as Mt. 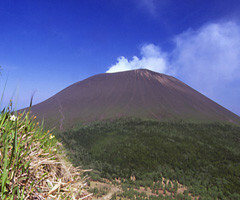 Kagonoto or Mt. Kurofu. From early May until October, all kinds of beautiful alpine plants are everywhere to be seen while hiking in the mountains. 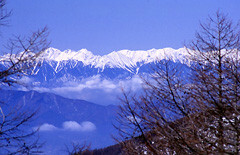 In winter, the Asama Mountain Range is covered by snow. From mid December until mid April, snowshoeing is very popular in the region. The hiking trails in summer turn into snowshoeing trails. A panoramic view of Mt. Asama will spread out before you if you take a trip through the snow covered alpine forest to the top of Mt. Kurofu. Guests staying at the hotel in winter can rent snowshoes, leggings and poles for free. Everyday from 9:00 to 12:00, we offer free lectures to beginners who plan to go to Takamine Mountain or Ikenodaira Marsh directions. Come and enjoy a breathtaking view of the bright Milky Way that you can never see among the artificial lights of the cities. Standing here high up in the mountains with the clouds under your feet, the starry sky feels like heaven. Every night from 20:30, we have a star watching party for about an hour in front of the entrance of the hotel. Our staff will give you a night sky tour. Please feel free to observe through our 3 large telescopes. 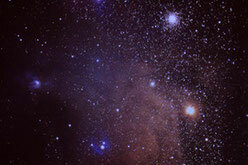 If the weather is not suitable for star watching, we will put on a slide show on stars. There are several snow resorts in this region. They are open as early as mid October depending on the weather that year. Cross country skiing is very popular. There are many cross country ski trails. The winter scenery is also fantastic with the snowcovered mountains of Japan Alps closely in sight, and Mt. Fuji above the clouds in the far distance. Guests in winter can rent full set for skiing, snowshoes, Kanjiki(Japanese snowshoes) and light climbing iron for free. We also offer free lectures to beginners.